This eco-friendly resort is a paradise tucked away in the jungle hills of Phuket. We found the tranquil zen of this resort to be in stark contrast to the touristy buzz in the city below. Rooms were large and beautiful, food was fantastic, ambiance was zen. 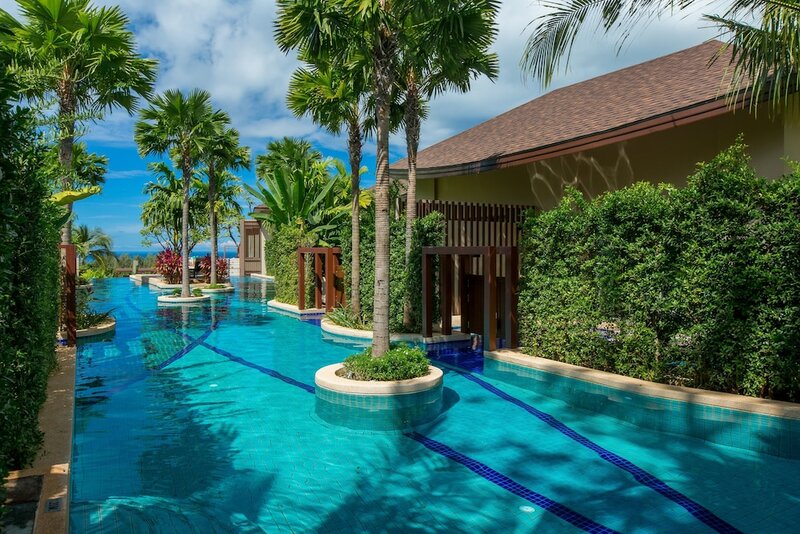 We both agreed we would only really want to return to Phuket to visit this resort. The hotel staff was exceptionally considerate. However I am not sure it is worth the price. Great resort, with very nice and spacious rooms, and a 10 minute walk to Karon beach. It's also a quick 20 min tuk tuk ride away from Patong beach and Bangla Walking Street for those looking to enjoy some nightlife. Beautifully appointed grounds and convenient to the beach (walk about .5 km) and the major shopping area of Karon Beach. Large selection of food at breakfast. The staff (front desk, housekeeping, restaurant) were professional and always looking to make sure that you are comfortable and enjoying your stay. Very hilly resort on the side of a mountain with great views of the sea. We would stay again if in Karon Beach. We had an amazing time here. The room was very nice. It was like living in paradise. Loved all the pools. Everything was clean and perfect. The breakfast buffet was delicious. Definitely would come back. Lobby looks a little too old as well as dinning place, but the hotel has nice view further down view to Karon beach. The check in was horrible for me waited for 15 mins with no one approached. Though they kindly upgraded the room with the view. Pools gym facilities are clean and well maintained. A bit of walk here and there in resort, you will enjoy the walk as trees around. Location isn't too great, but the place is cool. I think it is for married people or couples. I am so glad we chose to stay at Mandarava Resort and Spa. Hotel staff was continuously working to keep hotel in immaculate condition. They were always friendly and helpful. We enjoyed the separated dwellings of ~ 2 guestrooms as opposed to a multi-story, urbanized hotel. Pools were spacious and there were several swim up bars. The breakfast buffet was amazing and had a nice variety of food. Hotel was within walking distance to the beach and shops, though this is easiest if you don't mind climbing hills/stairs. Close to Karon Beach. 300baht taxi to Patong. Taxi service from hotel inexpensive compared to USA prices. The hotel was excellent. From the check in to check out everything was flawless. The room was huge & there were 3 of us in a Tropicana room. Bathroom had a deep soaking tub & separate shower. The breakfast buffet was outstanding. The staff & service all around was top notch (I am in the hotel industry). I would 100% recommend this hotel. It's also very peaceful & serene. The pools were beautiful. Ask for Mr. You from the driving service through the hotel, he was exceptional & his prices were inexpensive. A full 5hour sightseeing trip cost us 1500 baht so $45 USD. Also, the fitness center was great as I work out daily. Overall this resort blew me away. Lovely stay at Mandarava Resort away from noise and crowds. Staff was friendly and extremely helpful. Rooms were spacious and filled with light from large glass windows and balcony. Everything was awesome, the room, the pool, the food, the proximity to the beach and the staff was very professional and friendly. Excellent hotel. 5 star accommodations, good food (although only 1 restaurant) and helpful staff. A lot of walking on the property but worth it! Mandarava Resort exceeded my expectations. The resort was immaculate, spacious, and was in a great location. The staff was very helpful in suggesting things to do, sites to see, and arranging for pickups to/from the airport. The resort's restaurant had an excellent breakfast buffet every morning - plenty to choose from - and served lunch and dinner as well. Try the pad thai! I would definitely stay here again if I return to Phuket. It was okay. Again this is a resort so if you want to go out, you have to walk or take a car/motorbike. There's a slight hill that you have to walk so there's a lot of huffing and puffing; good exercise though. In addition, because Phuket is consider tropical.. there are bugs you have to deal with. There were small ants constantly in my room. The restaurant is nice but it's in an open area outside so there are bugs and flies flying around while you're eating but what's worse.. sometimes they are in the food.. because the hotel guest(s) get the food but they are too lazy to use the covers to cover the food. That's my 2 cents. Karon Beach is a short stroll from Mandarava Resort and Spa Karon Beach, and other popular attractions like Kata Beach are within a few miles (5 km). This 232-room, 5-star hotel welcomes business and leisure travelers with 5 outdoor pools, a full-service spa, and a restaurant. Enjoy a bite to eat at Chom Talay Restaurant, the hotel's onsite restaurant. Savor a meal from the comfort of your room with room service. For your convenience, a buffet breakfast is served for a fee each morning from 6:30 AM to 10:30 AM. Guests can expect free WiFi and 40-inch an LCD TV with a DVD player. Beds are dressed in premium bedding and the bathroom offers a soaking tub, a rainfall showerhead, a hair dryer, and free toiletries. Other standard amenities include a balcony, a refrigerator, and a minibar. Guests of Mandarava Resort and Spa Karon Beach have access to a full-service spa, 5 outdoor pools, and a children's pool. There's free parking and an area shuttle for a fee. The front desk is staffed 24/7 to help with tours or tickets, luggage storage, and dry cleaning/laundry. Other amenities at this luxury hotel include a fitness center, a steam room, and free WiFi in public areas. Chom Talay Restaurant - Restaurant specializing in international cuisine. Open daily for breakfast, lunch, and dinner. Sala Bar - Bar. Open daily. The hotel has 5 outdoor swimming pools and a children's pool. A steam room and a fitness center are other recreation options. The preferred airport is Phuket (HKT-Phuket Intl. ): 70-min drive, 28.4 mi/45.7 km.